Niall Toner reports that on 27 and 28 December 2007, at 6.00-7.00 p.m. each evening (Irish time), the Irish national station RTE Radio One will broadcast the first two programmes in the 'Nashville Sessions' series. 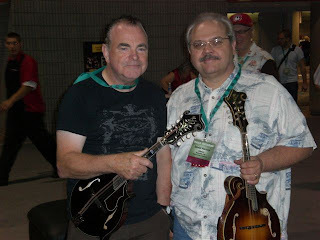 These will feature writers, performers, and instrument-makers interviewed by Niall and his producer Aidan Butler during their visit to the IBMA convention in Nashville during October 2007. Guests include Greg Cahill, Pete Wernick, Barry and Holly Tashian, Steve Huber, Goldheart, Broken Wire, Si Kahn, Steve Kaufmann, Keith Sewell, Wendy Buckner, and many more. 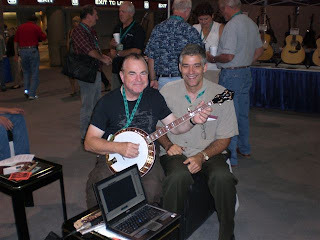 Details of further interviews with bluegrass people will be announced in early 2008. The NTB are currently working on CD #3, provisionally titled We believe in clean endings, featuring again all original material. Recording should be completed before mid-January, with hopes of a release date in early February. The NTB schedule for 2008 includes the Athy Bluegrass Festival; see details here. Packway Handle Band in Europe, 24 Jan.-17 Feb.